I was a little stumped trying to find a topic for today’s marry date or dump and so I looked at the top three YA books on the New York Times YA best seller list. Can we all just take a moment to be excited about the strong, diverse female characters written by female author that appear at the top of this list. At first, I thought I’d give you the love interests, but the protagonists of all three books seemed so much more interesting – so the choice is up to you if you want to do the boys or the girls, but I’m going to pick between Willowdean, Madeline, and Mare Barrow. Try to keep spoilers out of your comments, especially because I haven’t read Dumplin’ yet! 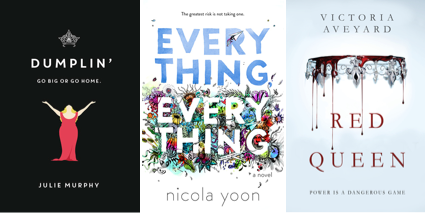 This entry was posted in Marry Date or Dump and tagged books, Dumplin, Everything Everything, Marry Date or Dump, Nicola Yoon, Red Queen, YA by Alison Doherty. Bookmark the permalink. So I haven’t actually read Red Queen yet, but my answers would be exactly the same as yours. I LOVE Madeline. So so much. I’ve read Dumplin’ and I have a lot of love for Will too, but Madeline all day every day. Lol. Just got Dumplin’ from the library and am so excited to read it!